While life has always been uncertain, today our choices matter more than ever. The decisions each of us make today will determine if we thrive, merely survive, or fail during the future time of upheaval ahead. The window of opportunity to change course for humanity is all but closed. There’s simpply no more time to hope that somehow, magically, the world's entire energy complex will suddently evolve to a bountiful and sustainable new plane -- whether by market forces, by maverick billionaires like Elon Musk, or by happy accident. As we hammer home constantly here at Peak Prosperity, energy is everything. Without it, our society simply can't function. And it's critical to appreciate that it takes an investment of energy to migrate from energy solution to another. Imagine you heat your house with wood, but want to switch to a forced air gas furnace. Is there energy involved in doing so? You bet there is. Besides the obvious new need for natural gas, there’s a huge amount of embodied energy in the manufacture and installation of your new furnace, all the duct work, and the delivery lines that will bring the gas to the furnace. Further, there will be electricity required to force the air from the furnace, through the ducts, and into your house. The same is true when making transitions at the national level. What’s involved in the much larger projects of switching industrial agriculture away from the fossil fuel driven process of plowing, planting, fertilizing, irrigating, harvesting, drying or cooling, and then transporting food from the field to your table? At each stage there’s an enormous amount of energy infrastructure that needs to be rebuilt and reconfigured to run on “something else.” Let's examine the current dream that we'll switchover to powering all of our farming needs with electricity. The manufacture of the tractors and their thousands of components all have to be completely reconfigured to run on electricity -- from the act of mining and smelting the metals used all the way through assembly and delivery to the farmer. At present, oil and other fossil fuel inputs are pretty much 100% of that process. The same is true for all of the other equipment and tools currently used in farming. Could we do all this using electicity instead? Yes, of course. Will it happen all on its own while we wait for “market forces” to do the job? Nope. Not a chance. Why? Because it's far cheaper, faster and easier to use fossil fuels. And humans are nothing if not lazy. Give us a cheaper and easier option and we’ll take it every single time. Which is no different really from a cheetah selecting a lame or slower gazelle over a faster and stronger one. It’s just how Nature works. Waiting for “market forces” to magically replace an already-embedded, cheaper and easier energy source is hopeless. Absent a crisis that forces us to, as a society, we’d have to proactively decide to make that transition a top national priority and become deadly serious in our pursuit of it. And if we actually were to do this, it would certainly be a painful process for a good while. Huge job losses and dislocations would result, as whole categories of jobs become irrelevant and vast swaths of the labor force go through re-skilling. Our economy's “growth forever” model would come tumbling down because it’s been heavily subsidized by cheap surplus fossil energy. That would no longer be the case. So stocks, bonds and real estate would tumble, ruining the retirement dreams for many. It would prove difficult to run a top-notch military (which burns through oil and other critical resources like nobody’s business), feed everyone, travel as we do, and heat and cool everything. We’d probably have to make material sacrifices across each -- or give up one or more of them entirely. The point here is that, in the ten years I have personally been banging on the drums of logic and reason, I can honestly say that virtually no progress has been made towards developing a credible action plan for weaning the global economy off of fossil fuel. Humanity seems fully committed to its current trajectory: the cheap and easy path. At least, until something forces our hand. Which makes us no different from any other biological organism. No different than the simplest bacterium in a petrie dish that multiplies until it has consumed its food supply, then is suddenly faced with starvation. One of the saddest elements of this story is that we've had many chances to reform ourselves along the way. Economically, we could have (and should have) used the crisis of 2008 to allow a bunch of literally useless financial firms bite the dust. But didn't; we saved them all. And now have a Too Big To Fail system that’s even "Too Bigger" than before [sic]. We might even - if we wanted - give a break to these youngsters by cutting fuel and metal consumption a little here and there so as to provide a safer margin for the necessary adjustments which eventually must be made in a world without fossil fuels. One final thought I should like to leave with you. High-energy consumption has always been a prerequisite of political power. The tendency is for political power to be concentrated in an ever-smaller number of countries. Ultimately, the nation which control - the largest energy resources will become dominant. If we give thought to the problem of energy resources, if we act wisely and in time to conserve what we have and prepare well for necessary future changes, we shall insure this dominant position for our own country. Such amazing and easily understood insights by one of the most intelligent accomplished people in US history. And that was just a very small set of snippets from a longer speech (you can read his full speech in PeakProsperity.com's Essential Articles section). Fossil fuels are not renewable. Burn them and they are gone. A little self-sacrifice today would go a long way in the future. Energy output creates political power. Therefore conserving and controlling energy are determined by political will. Most of the world is still behaving as if these simple points are too confusing to digest. As if there were some other, more hopeful, outcome to our reckless behavior of frittering away such a valuable and non-renewable resource on such blind pursuits as expanding the world’s population to some eventual maximum, destroying topsoil and ecosystems, and selling as many SUV’s and trucks as humanly possible in any given quarter. There’s only one outcome for any organism that grows until it slams into the limit of its energy boundary: Collapse. Is there any evidence we're in danger running into that boundary soon? Absolutely. Important warning signs we'd expect to see in the oil space would be declining discoveries and increasingly desperate attempts to scrape the bottom of the barrel. Both signs are upon us with vigor these days. 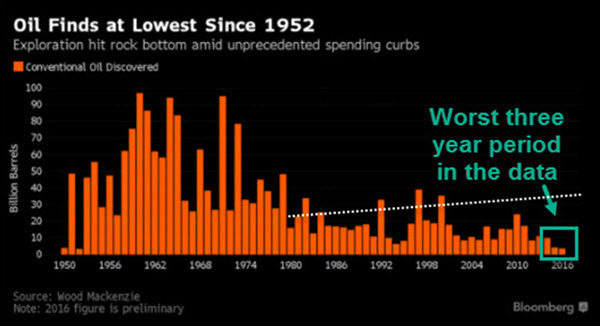 The white dotted line in the above chart indicates that, four years excepted, the level of discoveries has been well below consumption since 1980. And the yearly gap has been growing over that timeframe. Consuming more of a non-renewable resource than you're finding? It doesn’t take a geologist or a math whiz to work out the implications of that story. 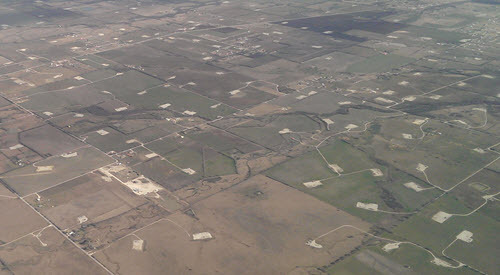 Each one of those little white squares is a one to two-acre drill/production pad. The earth is scraped away, the drill rig brought in, then the fracking and finishing trucks arrive – some 1,200 truck trips in all – just to poke a single hole that will (hopefully) produce a few hundred thousand barrels of oil. 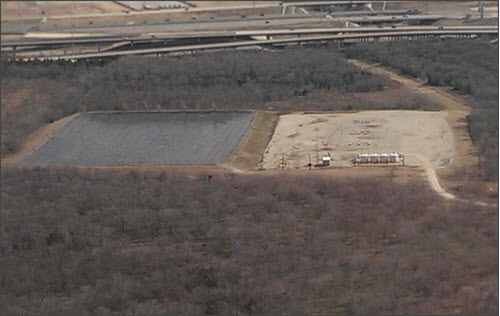 Here’s a drill pad on close look as the plane was landing, showing also an associated waste pond where the fracking fluid that blows back up the drill hole is captured for later disposal. These ponds need to be big, because millions of gallons of wastewater is produced at first, often laced with highly toxic compounds. The above are perfectly good warning signs that we’re out of the good options. The days of gigantic deposits of easily-extractable oil are gone. Now we’ve got this stuff. It's smaller, lower quality, and requires a *lot* more energy/effort to get out of the ground. Of course, that's not stopping us from going after it. And I’m not (necessarily) against that, as long as we admit to ourselves how extreme these measures are, and what this means for our future. Where the Romans had their omens and auguries, the rise of oil fracking is an important portent of what lies ahead for modern society. Art Berman refers to the current shale bonanza not as a "revolution", but as a "retirement party" -- and he’s right. What happens after someone's retirement party? Life winds down. The energy of their youth is no longer with them. The same is coming true today for America. But so far, the signs say that, as a group, we lack the ability to organize effectively against big, complex challenges. Especially if doing so requires us to willingly choose to live a life of less. We're simply too addicted to more. Admiral Rickover suggested that living within our means would be a smart and honorable thing to do for future generations. But his speech represents something of a high-water mark for conscientious thinking at the government official level. Here’s the thing: Unless there’s a very sudden and rapid change in how we are approaching the looming brick wall of resource shortages, the future is going to be quite difficult. Most people will be caught unprepared. As a result, many of them will suffer, and possibly fail completely to continue on. A smaller few will survive, stoically soldiering on. But an even smaller percentage -- those who heeded the warning signs and prepared prudently in advance -- will be positioned to thrive through the coming adversity. Where I have lost my faith in large groups of people, I have more faith than ever in those prospects for "awake" individuals and small groups. I'm inspired by the number of people I’ve met who are taking smart, regenerative, innovative steps to align their personal actions with the big picture realities discussed above. To those already pursuing resilience: I know it’s not easy staying focused and on track. The Powers That Be have poured considerable resources and effort into painting the illusion that "All is well". They’ve poured $trillions into the stock and bond ""markets"", in part to send a false signal of comfort, so that people will not spook and instead continue to borrow and buy. They, along with the compliant corporate-controlled media, have committed vast sins of commission and omission in the narratives that they choose to promote or suppress. Bubbles are powerful social signaling devices. Staying out of them and out of harm’s way is really difficult, especially as the party rages hardest right before its end. One of the responsibilities we at Peak Prosperity take most seriously is reminding you of the dangerous seduction of asset bubbles. Don't get taken in. Don't be the "greatest fool" who capitulates and jumps in right before the crash (remember: even Isaac Newton got suckered by the South Sea Bubble). And in Part 2: What I Am Personally Doing To Prepare Right Now, I detail what I am doing in my life right now to make good decisions in difficult times. Many of you have been asking about which specific steps I'm prioritizing these days. Well, I'm answering. Look, someday this ridiculous era of the Everything Bubble will be over. First, it’s going to get a little bumpy -- and then, really bumpy. When that time comes, hope the preparations you've made in advance will be enough to see you through, and hold fast. Then hang on for as long as you can. Guess what I was doing. today? Now that I'm of retirement age, does that make me a "fossil" fuel source? I have been pretty successful with an extended garden and can raise a bumper crop of potatoes or corn to feed the whole neighborhood. That is with a diesel tractor. How do I convert to horse or mule power to accomplish the same result? I do not own enough land to grow forage a draft animal requires. I also have no knowledge of care of draft animals or access to their implements. It's a simple question but it is my dilemma that I have no answer for. 2-1/2 acres probably won't cut it for a going homestead in the future.. I think you will need lots of hardy young sons and the acreage to make it work, just like it used to be. 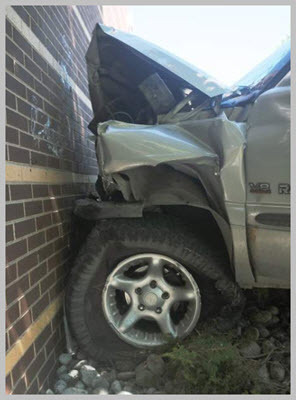 The car hitting a wall isn't a good analogy. It's sudden and either has no warning (because of fog or similar visibility limitations) or you could see it and it would represent a clear event in the future. A better analogy would be a road with pot-holes that keep getting bigger. Pperhaps the road has been washed out by a severely flooded river ahead. You know that when you reach the river the road will be gone, or that you'll eventually hit a pothole that swallows enough of the car to stop it. However the driver keeps barrelling along, insisting that since the car survived all the potholes so far there's no need to turn back or find a new route. You don't know exactly when the pothole from hell will kill the car but a thnking person knows the current road is going to end badly. "Another great article by Chris Martenson of Peak Prosperity on the quickly approaching challenges of transitioning to a world of 'less'. I find this particularly timely given the upcoming municipal elections in Ontario where, once again, we will experience a deluge of campaign 'promises' of more and more by political candidates. More services. More affordable housing. More infrastructure. More development. More growth. More. More. More. Of course, the infinite growth culture they promise collides with a finite world. But, illusions must be maintained...they help reduce our cognitive dissonance--or, as Friedrich Nietzsche said "Sometimes people don't want to hear the truth because they don't want their illusions destroyed." (my recent conversation with a candidate in our ward about this can be found here: http://olduvai.ca/?page_id=8601)"
Seems like a similar thought process in my area. The comment: "Furthermore, we need to expand our tax base in the commercial area where it can be set much higher than residential rates and help support the Town financially." could be a cut-n-paste for the rationale here as well. Growth requirements for water, sewer, and other related infrastructure appear to be mostly an after thought. Very interesting dialogue with your municipal representative. They (the political types) must all get together to develop and share "boilerplate" responses to their respective constituents' questions. For awhile now, I have struggled with the gap between Peak Prosperity members reviewing the data about the world, and being versed in what to do about it. I really love this community of people, so that gap has worried me. Arlene and I have attended a couple of Rowe seminars, and while we heard many attendees talk knowledably about the need to plant gardens, have access to water, store food and medicine, be able to protect their families, etc, we were honestly surprised that many of these same people had done very little to take concrete actions. We went to Rowe expecting to learn from like-minded others who were taking action, and found there were few (at least at the times we attended). I say this not to be dismissive, judgmental, or disrespectful. I want to make what I believe is an important point. Doing this stuff is much harder than most people understand. Chris’s story of the “”Black Death” is a perfect example. Arlene and I have planted gardens and an orchard over the course of several years, and we learned it is very challenging in ways we never fully imagined or appreciated. Plant and tree diseases, insects, animals, soil type, erosion, frost, physical exertion, necessary tools, seasonality relative to when crops come in, harvesting, canning are all part of it. We have learned so much from our mistakes. Our biggest learning is the realization that if we were trying to do this for the first time, during a “long emergency”, we’d likely be very hungry. We have had good friends tell us that if there is ever an emergency, they will “just plant a garden in their backyard.” We just quietly shake our heads, and then try to get them to understand the challenges and realities of living from a garden. And yet, none of these friends have moved forward with the information we have provided them. It scares us for them. Another example is around personal protection. When we did an inventory of our skills around this subject, it was clear we were deficient. Over the years, we took extensive firearms training, and what we learned was all the things that can go wrong with specific types of firearms, the dangers of not knowing how to handle firearms, the need to understand tactics, how to fortify our home to make it more defendable, how to create “force multipliers”, how stress effects your ability to shoot well, etc. Like many, we started with training to shoot handguns. In my estimation, that was a mistake. Handguns are the best choice for concealed carry, but are very challenging to use under stress, as they tend to lack accuracy and stopping power. This opinion was solidified for me, when we took rifle/carbine training. In these courses, I learned from Army Rangers and former Seals that 1) There’s a reason new recruits fresh out of boot camp, are sent to war with a rifle, and not a handgun (I.e., they are far easier to shoot, far more accurate, far more deadly at close and long range). 2) The military always trains their soldiers that their rifle is their primary weapon (for the reasons listed). They never touch their handgun (which they call their secondary weapon system), unless their primary (rifle) jams, breaks or runs out of ammo. I am saying all this to make a point that I hope does not come off badly for those considering handgun training. We too began learning firearms by starting with handgun training, but along the way learned that trying to protect our family durning an emergency using a handgun, would potentially be a grave mistake. We learned from training that shooting under stress, had a radical impact on marksmanship (especially with a handgun). We learned that understanding basic tactics could make a fundamental, life saving impact for someone in an emergency. Perhaps most importantly, we learned if you don’t use it, you lose it I.e., to shoot effectively, we needed to practice; regularly. I’m really happy to see Chris sharing his pragmatic gardening challenges, because it’s consistent with our own experiences around resiliency building. I’ve been concerned that we all need to be talking more about the mistakes we’ve made, and what those mistakes have taught us, so we can learn from each other. We might also benefit from dialogue around what we know we need to be doing, but why we have not yet done it. I think there’s a story there we need to be honest with ourselves about. Said another way, if you were on the Titanic, and knew it’s fate, would you be ordering a drink? Not likely. So what’s behind our own measured, leisurely pace (mine included)? You could turn your garden by hand, using basic garden tools. The key is to start in the fall, around this time of year. A little at a time, everyday you work a couple of hours at it. By the time november hit and ground is frozen you will have quite a huge garen plot turned over. I did that the first year I moved to my farm and had no tractor. You're going to say "oh my god thats too much hard work" Boloney. You only think that because you are not used to working. The trick is to keep the work light, and do a little at a time over long period of time. I still do all my own firewood splitting by hand, milk my cows by hand, clean stalls by hand, and lots of other work too. People think its such hard work, but you ease into it and your body adapts quickly. Off to cut some more wood right now...then Ill take a break and clean the stalls. A little at a time, breaks in between, less time in front if the TV can do wonders. Well said. Here are a few of the 'trials and tribulations' I encountered this past season in my garden. First, in inspecting my garden in the spring, I discovered my attempt to make our gas meter more accessible to the gas company for reading (leaving our gate to the back yard open so I wouldn't have to keep shoveling the snow from behind it so it would open), gave access to the rabbits that inhabit our front yard. The result: all of my blueberry bushes and blackberry canes in the back were decimated. Waskily Wabbits! Second, I was ecstatic when our two Macintosh apple trees bore dozens of small apples for the first time since their planting a dozen years ago. Come June, however, all but 3 dropped off the tree (since eaten by neighbourhood squirrels). Little did I know that the aphids that had been feeding themselves off the apple tree leaves would prevent enough photosynthesis for the production of enough carbohydrates to prevent 'June Drop'. My research since June has helped me to realise that I will have to spray my fruit trees with a horticultural oil/water mix in the late fall and early spring to fight the aphids, and then use a Castille soap/water mix after the leaves bud to keep the aphids at bay. Third, while I have had significant success with peas in the past, this season was less than stellar because of the early and persistent hot weather we received in southern Ontario this spring/summer. I barely had enough grow to maturity to supply me with enough seeds for next season. Knowing this I will now attempt to save enough seed for two seasons going forward rather than for one season. Fourth, we had our first crop of peaches last year and were looking forward to another this fall. Unfortunately, no flowering or peaches this year. My eldest daughter wonders if my trimming of the tree last fall was excessive...still have to research this failure. But, some successes. I attempted cucumbers from seed for the first time and managed several dozen. We enjoyed them in our dinner salads. Tried pole beans for the first time and they were immensely successful. Lots of dinner meals and plenty of seed for next year. The most raspberries produced over the years (I like to think because of my ongoing learning on how best to trim/train them) and plenty to try making raspberry jam for the first time--now trying to grow my own chia plants for the seeds that I used to make sugar-and pectin-free jam. The cherry bushes planted several years ago began to bare fruit for the first time and am looking forward to more next year. The hardy kiwi plants I planted six years ago also bore fruit for the first time and they were excellent (when left in the window sill for a few days after picking to properly ripen...not so great when picked right off the vine and eaten immediately). Cheers and good luck to all!! Chris, for a guy who's so into nature you completely dismiss HUMAN NATURE which is a manifestation of all nature. Change happens through necessity. Crisis forces adaptation. Thats the way the world works. Why get stressed about something way beyond your ability to change? They've tried it your way many times and it always ends in disaster...remember solyndra? That was the government trying to force innovation and only resulted in waste and corruption. We cannot control everything...we dont know enough to even try. Above is team harvesting large russet potatoes. The tractor on the right is a windrower digging a width of 16ft (four rows). It positions them in between two unharvested rows for the digger to pick up. The green tractor in the center is a pull tractor. Behind the pull tractor is a digger, which also harvests 16ft, while picking up the potatoes that the windrower positioned on top of the rows in front of the digger. On the left are two potato trucks, one being filled and another in position to move forward, once the lead truck is fully loaded. Empty, the potato trucks, like the ones in the picture, scale at 23,000 lbs. Fully loaded, they scale out at 56,000 to 60,000 lbs. The pull tractor's job is to pack a trail in front of the potato trucks and pull them out, if they get stuck in the mud, a frequent occurance. A typical harvest crew is 10+ people, depending on the number of trucks dedicated to the field. This crew had eight trucks. On a reasonably good day, a team like this can harvest seven to nine loads per truck. With eight trucks, that 56 loads, or around 2 million lbs of potatoes. It has occured to me, recently, that what keeps this industry hopping is not baked potatoes, served as a side dish. What we are talking about here is french fries and potato chips. If everyone stopped eating those, this industry would wither and everyone would loose weight and get healthier. Many good points. I, too, have noted that it takes more time than I would like to learn new skills (farming). Anyone who thinks it is easy will be surprised. One point that has been driven home this past year is that nature is a harsh place. Not all the eggs hatch. Not all those born (or hatched) survive. Some mothers ignore their own weak or injured offspring in favor of their more robust siblings. Even when you do most of it right predators still find holes. I am glad we have some of our mistakes in our past. Yes, so I am putting up a field fence with wooden posts. The wife says " You can't dig all those post holes by hand" Well I am and got about seven done on and off today while using a spud bar to break up the hard and rocky ground in places and post hole diggers to clean the hole out. I also did all my normal chores and moved a small greenhouse out of the way of the fence to a different spot. It will take me awhile but I will get the whole fence installed with hand tools. And I will use my fork this month to turn over my largest plot yet for garlic planting. My comment about draft animals is about more than just feeding my family. It is about growing enough to feed a small community many of whom can't do the labor needed to bring in enough of a crop to feed themselves. I am not talking about a vegetable garden. I am speaking of enough ground to to grow cereal grains and potatoes, not for french fries and chips but for badly needed calories to support a larger community. In time I am sure we will all learn the time proven wisdom of "If you don't work, You don't eat". I choose and wish to be able to feed as many as I possibly can. Roger on the TV. Haven't watched one in ten years. Thanks for the links. Checking them out now. Looks like great info so far to get me on the right path. Chris have you seen this? It sounds lovely but from what I know it’s a fantasy. Would love to get some feedback. If it has already been discussed please point me to the discussion. Sure seem to be making a move, and it's rattling markets. Asian markets were pounded. Is there anything amiss I'm not seeing? Things moving under the surface? I see the dollar is down a bit, and oil futures too, but that's typical for any given day, I think. Granny - I have to confess to being somewhat irked by Rifkin. He gets far by saying things people want to hear, not by telling the full truth. He's a smart guy, so he should know better, and I suspect he does. If we look at the great economic paradigm shifts in history, there's been at least seven major economic paradigm shifts. They share a common denominator. At a moment of time, three defining technologies emerge and converge to create what we call in engineering a "general-purpose technology" that forms an infrastructure that fundamentally changes the way we manage power and move economic activity across the value chain. And those three technologies are new communication technologies to more efficiently manage the economic activity, new sources of energy to more efficiently power the economic activity, and new modes of mobility, transportation logistics, to more efficiently move the economic activity. In bold he shows he gets it. New sources of energy to more efficiently power the economic activity. That's also code-speak for "high net energy." Then he veers off into a complex web of ideas that somehow the internet of things plus some fancy new high tech stuff is going to allow us to somehow, magically, use low EROEI alt-energy to replace fossil fuels. I think that's complete rubbish, an unproven fantasy that has literally zero real-world examples to support it. The high-tech world he envisions is not a divine right but a happy by-product of having an enormously complex economic system coupled to a lot of people with plenty of free time on their hands to build, maintain and improve on all that complexity. Complexity itself is a by-product of surplus energy. Not the other way around. When I got to Berlin, the first question I asked the Chancellor — she'd only been in office for a couple weeks — I said, "How are you going to grow the German economy" — and this is crucial — "when your businesses are plugged into a second industrial revolution infrastructure of centralized telecommunication, fossil fuel, nuclear power, internal-combustion transportation for roads, rail, water and air transport, and we know that the productivity in that infrastructure peaked, and all the major industrial countries over the last 10 to 15 years?" In other words, there's nothing more that you can get out of this. Why do we always need to grow or to "get more out of this"? What happens when there's no more growth? What then? This is such an obvious question to ask that - well - I get annoyed. On that first day I discussed with her [Merkel] this emerging third industrial revolution infrastructure that we had been developing for the EU. A convergence of the communications internet, which has matured, with a digitized renewable-energy internet. And both of those internets converging with a digitized, automated GPS, and soon completely driver-less, road, rail, water, and air internet, to create three super internets — communication internet with 5G, renewable-energy internet, automated-transport internet — to manage power and move Germany. And the most important part of this is those three internets ride on top of a platform called the Internet of Things. Jeebus! He's talking about complexity layered on top of complexity layered on top of even more. Also, WTF is a "digitized renewable-energy internet"? That's some grade-A BS jargon right there. Why? Because there's precisely zero of it anywhere at present. And don't give me any of that "but Google is running some of its server farms on renewable energy!" because Google is doing no such thing. They are buying electricity from hydro dams exactly zero of which have been built using electricity of any form let alone renewable. Further Google is using components (servers, cables, etc.) exactly zero of which were mined, built and transported using renewable energy. For guys like Rifkin these things just magically appear, ready to plug into a utopian alt-energy future but they apparently know nothing about the entire scope of the supply chain. Actually, I suspect they know that very well, but also know that saying such things won't get them to later name-drop about important meetings with chancellors and earn big paychecks. The truth is we're still using mostly fossil fuels and when those begin to go away our economic complexity will begin to suffer and wilt. Then the complex layered "internets on top of internets" he's promoting will prove to be impossible to maintain let alone advance. Chris, thank you for taking the time to provide a comprehensive explanation. Members of my family work in a Telecommunications and “The Internet If Things” is the up and coming technology and focus so someone like Rifkin gives one pause for more thought. His talk was lively, encouraging and provided solutions, unfortunately like big juicy worm on the end of a hook, there is a catch and I just couldn’t bite. It’s useful to ponder alternative ideas and deconstruct them so as to encounter possibilities we haven’t thought of. At least for me as I love those “ah-ha light bulb moments”. Sorry. I'm particularly surly and snarky tonight, which isn't a good combo. Just in case anyone still doubts. We absolutely should reform the banking system, but we also have to be eternally vigilant because new criminals will come along and pay the government (another set of criminals) to make their crimes legal. Despite the fact that Philly is the poorest large city in the United States, it’s hard to ignore the amount of money it hemorrhages in feats of fiscal malfeasance. Those losses have become so significant that the city’s own Controller has blasted its accounting practices as the worst among the top 10 largest cities. That’s clearly a designation no city would want, least of all one with such a high skyline profile as Philadelphia. And, yet, its elected leaders have barely budged towards reform since we fully grasped the magnitude of its dire budgetary straits. The assumption is that if you’re charged with that much level of abject financial loss as a government, you’d be frantically racing towards some form of correction. Philly should be panicking, especially in the wake of a national Recession that did it no additional favors—and left the city still begging for a recovery. Instead, we have relative calm over at City Hall. There was much more vein-popping and political maneuvering in the reaction to Controller Rebecca Rhynhart’s finding of nearly a billion dollars in accounting errors than there was an immediate reflex to fix it. City finance jobs have oddly remained in place when there’s need for house cleaning. The absence of alarm is remarkable. Read the details, then weep. Do you think pensioners will get everything they worked for and were promised? ...only this time through the house is on fire. Great article, thank you Edwardelinski! In George Orwell book 1984 I remember there was a time-out for “hate” when all citizens would shout, snarl and condem a specified entity to hate. We are not that far off from Orwell’s book these days. Sooo who shall we hate this week?? ?